A New Season Gives Reason to… Change? After a brutal Winter, most of us are all too happy to embrace the Spring. We are ready to climb out of our ruts and spring forward into a new rhythm. As this warmer cycle unfolds, I think a revealing positive energy sprouts too. The days are longer and brighter and we sense the excitement of the warmer season yet ahead of us. Change is in the air. Do you feel it? I write frequently about seasonal change as a natural motivator for personal change because I’m continually struck with its powerful impression. It wakes us up in a very organic way and pokes us to take another look at where we are. For those who are “self-reflect-ers,” we feel this very deeply. Spring is my favorite time of year because along with its glorious bloom, it is filled with hope and promise and opportunities not yet realized. Every season has its unique beauty, but the contrast from bare naked trees to lush green lawns is as drastic as black and white is to color. The delightful fragrances of spring flowers like lilacs, hyacinth, and freesia are intoxicating. It simply cannot go unnoticed. In just a matter of weeks, we will open the windows again and allow the fresh air to revitalize our homes. Our senses will be heightened with the scent of freshly mowed lawns and the cacophony of children’s laughter playing outside once again. Outdoor activities will surge and we will notice more and more people biking, jogging as if it were an ordinary day. But before you fail to notice these change any longer, and before we take it for granted, take that small window of time to stop. Acknowledge that a new season can open up new possibilities. Spring cleaning can mean so much more than the “physical” clearing out of our dusty and cluttered spaces. It can be a great opportunity to re-align ourselves once again. With so many positive physical changes in the air, it may cause you to feel very different too. Spring signifies a time of beauty, freshness, bloom, change, and growth. It is the ideal backdrop for inspiration to cultivate and perhaps instigate a shift in thinking about our own personal growth. Appearance: You might think about changing your appearance; a new haircut or change of hair color. Men have the opportunity to noticeably change their look by growing facial hair or shaving it off. Modifying appearances can make a huge impact on how a person feels. Changing up your wardrobe by buying something new can spruce up your look and boost your spirits. Time-management & Productivity: Adjust your routines and schedules and take advantage of the longer days and warmer nights. Consider the time-wasters. Energy is up and so it’s likely to impact your productivity as well. In fact, you will probably notice you’ll want to do more. Self-care: Spring may spike your health and fitness goals that may have been otherwise dormant. This is a great time to get fit and eat healthy. Inspire to look good and feel good. Spring Clean: Give your home a new make-over too. Assess the NOW. Let go of those things that no longer provide value, any longer. Start fresh. Try Something “new”: Perhaps this spring will ignite a new passion. Let it. Try something new. Plant a garden or take a hike…the possibilities are endless. Challenging yourself promotes self-growth. Gratitude: Maximize your outdoor activity and embrace the splendor of Spring. Unfortunately, it is short-lived. Enjoy the NOW. Time fleets from Memorial Day to Labor Day in a blink of the eye. Ought we not “latch on” to this sense of spring awakening and “catch” the fever? Will spring fever infuse a personal change in you? What kind of changes are you ready for? 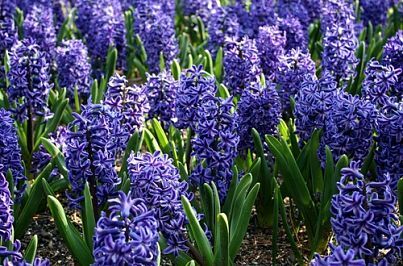 From your wonderful photo, Nancy, I can smell the aromatic scent of the purple hyacinths along with the fresh earth. Spring is a magnificent time not just in how it graces our senses, but also in how it makes us feel…hope-filled and poised for growth, changes and new opportunities. It’s a season of lightness… a time to reset, rethink, and move ahead. Thank you for highlighting some of the ways to embrace change now. What an inspiring post, Nancy! I tend to think of September or January as the best times to make life changes, but why not the spring? With the warmer weather and longer days, we have more energy, so why not take advantage of that?